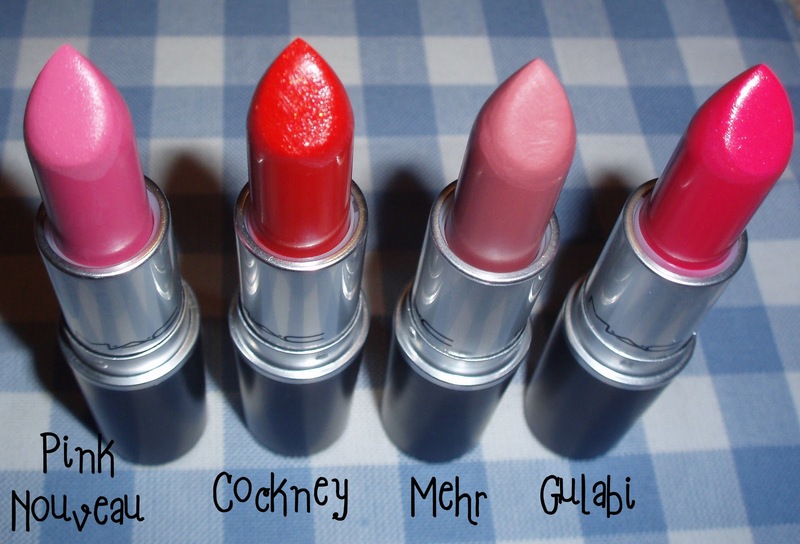 I thought I'd share with you a piccie of my new lipsticks! I have really got into wearing lipstick, it was always something I wasn't too bothered about but I really feel like it finishes everything off! As far as new lipsticks go I'm in love with style curve! I was really scared of the colour when I first saw pictures of the stylishly yours collection but I've been meaning to try a purple toned lippie for about a year so I took the plunge and tried it since temptalia said it was pretty sheer so I figured I might be able to work with it and I'm SO glad I did. It's so much more wearable then I ever would have imagined, especially since i'm super pale. I love it! I'm actually really tempted to pick up cockney now. I have several red lipsticks but none that I wear all that often and since it's sheer maybe it would inspire me to try it out more often... can't decide! My fav would have to be Lancome 'Yummy Berry'. It's not a new colour but I just love it on and it's delicious to wear. Unlike you Hannah I wear lippy all the time. You're right it does complete the look. Love the red! x hivennn. p.s enter my giveaway?